Wow... it's like a heatwave here in Chicago today! We reached 40 degrees here downtown and to us Chicagoans, it's hot enough to break out the flip flops (at least for me). Originally I had planned on a cold weather meal for dinner but given the higher temps, it was burger night in our house. My husband's friend, Gabe, came over for dinner so I wanted to prepare something nice, casual and easy to put together after a day at work. Burgers seemed to fit the bill but I wanted something a little different or burgers with a slight twist. A few weeks ago while at the store, I spotted Pretzel Buns in the bakery section. I immediately put them in my cart because one of my favorite burger joints in Chicago serves all their burgers on pretzel buns. I have yet to make pretzel buns from scratch but for now, buying them out of convenience worked for me. With these pretzel buns, it would have been easy to just make a good old beef burger but I really wanted to highlight the pretzel flavor of the bun itself. Thinking of meats that would compliment the pretzel flavor, I thought of bratwurst and figured I could make a bratwurst burger to give the buns some justice. Remove the bratwurst sausage from its casings. Divide the sausage into 4 equal portions. Form each portion loosely into a 3/4 in thick patty and make a deep depression in the center with your thumb. Season both sides of each burger with salt and pepper. Cook the burgers on a dry skillet over medium high heat. The natural fat in the sausage will render and help cook the burgers so they don't stick and as a result, no oil is needed. Flip the burgers once the bottom side has cooked through and browned. Topping each burger with a slice of Swiss cheese and a basting cover during the last minute of cooking. Slather each of the toasted bun tops with Dijon mustard as desired. Place the burgers on the toasted bun bottoms. 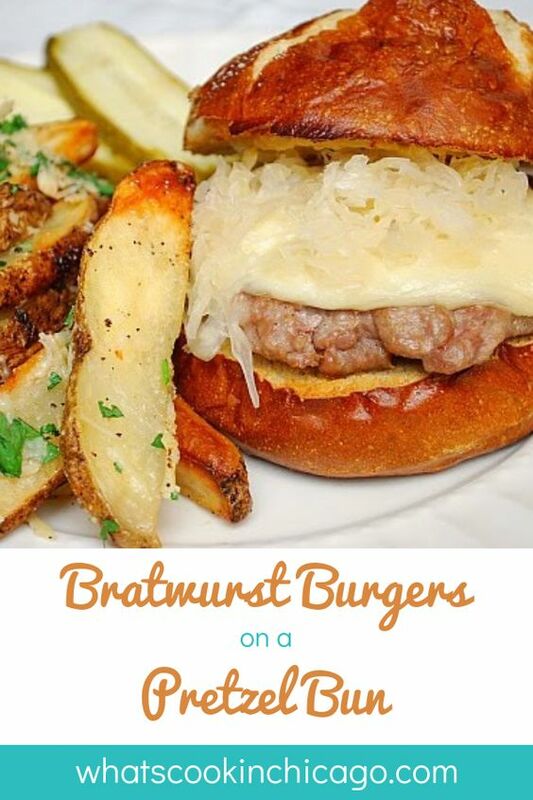 Top the burgers with sauerkraut and then the bun tops and serve immediately. Man Joelen! I will completely and utterly move back to Chi-town now just for pretzle buns! We miss pretzle bread SOOOO much!!! I'll have to have my mom or brother look for them at Dominicks for me and send me a bag or two to freeze here at home. To my knowledge, Dominicks does not sell Pretzel buns. The Labriola brand of pretzel buns appears to be most popular and is available at some specialty grocers such as Olivia's Market. Traders Joes also sells them (TJ brand). Oh man do those sound wonderful. We don't have pretzel buns, but we have pretzel rolls so I could make these a little smaller.